Baixa was our base for exploring Lisbon. We dithered about which neighbourhood to stay in until we stumbled on Browns Central Hotel. It happened to be in Baixa, choice was made and it was thumbs up all round, the hotel and the area ticked all our boxes. 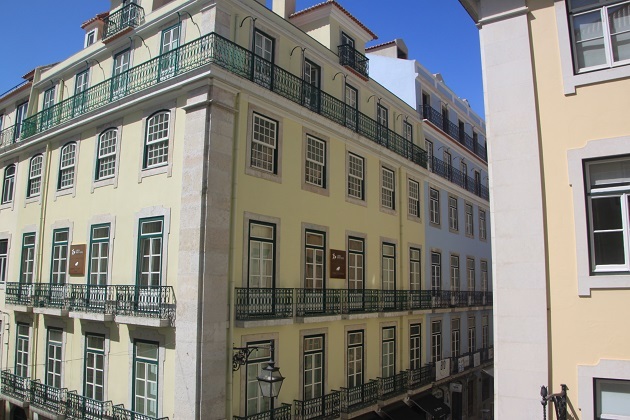 Baixa is attractive, felt very safe at all times of the day and evening plus is packed full of restaurants, bars, shops and a splash of interesting history. The streets are grid-like and even someone with the worst sense of direction (like me) would find it impossible to get lost here. The whole area was developed after being flattened in the 1755 earthquake. Before then opulent palaces stood here, these were replaced with simple buildings for tradesmen and merchants. The neighbourhood starts at Commerce Square and the streets retain their original names and match the trades of the people who once worked here. 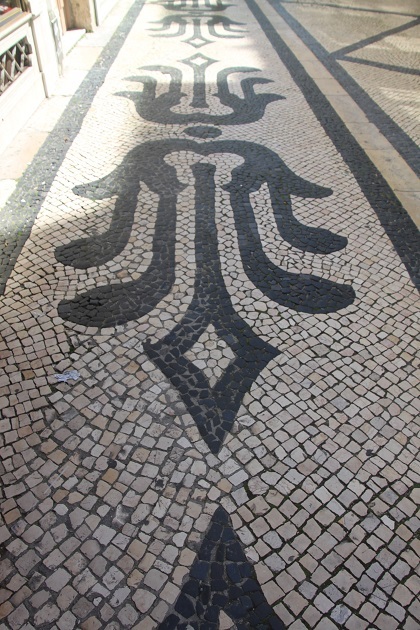 Baixa was always buzzing anytime we strolled through. 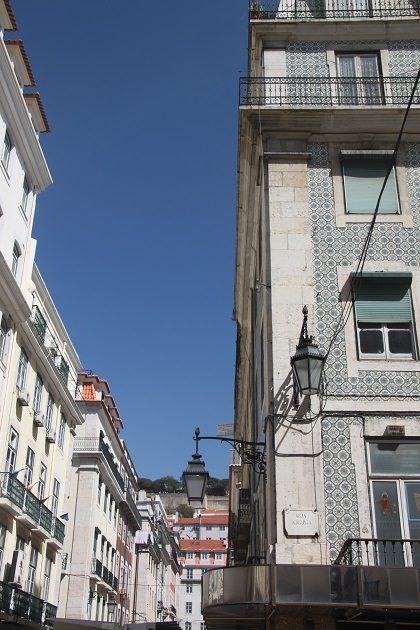 The Rua Augusta is pedestrianised with stacks of street sellers, artists and no end of restaurants, cafes and shops – albeit extremely touristy. We didn’t eat in this area, better, less touristy options can be found just a short distance away. 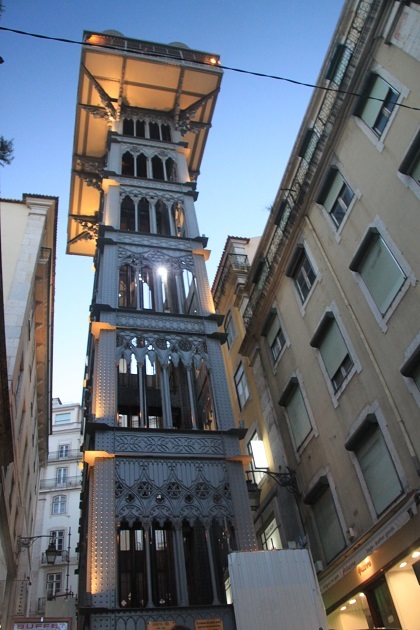 My real Baixa highlight was the Santa Justa Elevator – so beautiful and quirky. This is a 45 metre high, neo-gothic iron tower with a functioning elevator. 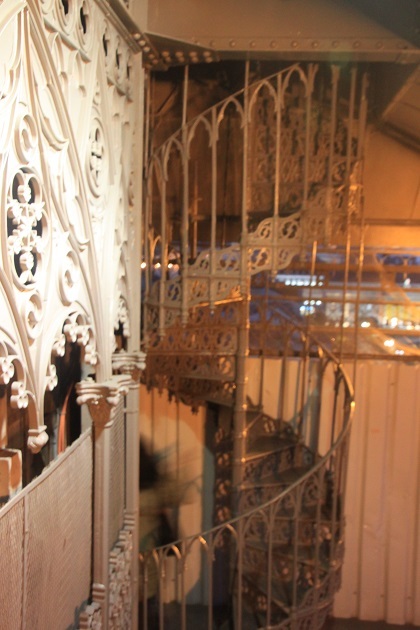 The ironwork structure is beautiful – you can spy the elevator from different view points in the city. We visited in the evening and joined a relatively short queue to ride the elevator to the top. Anytime we passed there was always a line, it seemed to be a lot longer during the day time, our wait was very short. If you buy a day travel ticket for the metro/tram etc. in Lisbon it is also valid for the elevator – which I thought was great value. We stepped into the gorgeous polished wood carriages and I instantly felt transported back in time to a grander age. The lift whisks you to the top in style. The elevator was built between 1898 and 1901 to the plans of an architect who was an apprentice of Gustav Eiffel. 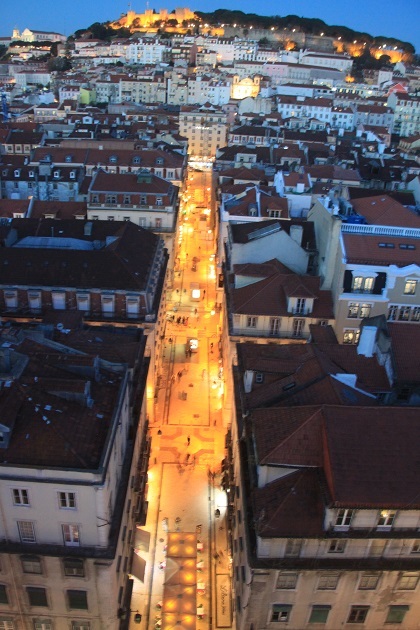 It was built to transport people between the low lying streets of Baixa to Carmo Square – the lowest and highest points of the city. 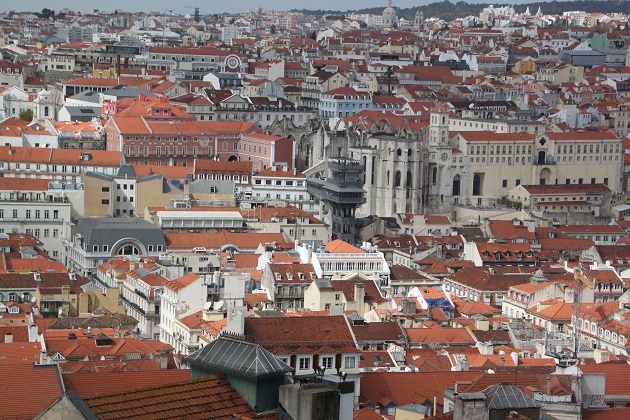 As well as being a Lisbon must, it still eliminates what would be a steep and hard walk. Originally powered by a steam engine, it was converted to an electrical motor in 1907 which still powers the lift today. It is now classified as a National Monument in Portugal. Riding the elevator in the evening was perfect for us. We were enchanted by the twinkling city lights below when we stepped out onto the viewing platform. There are some stunning panoramas of the castle from up here too. 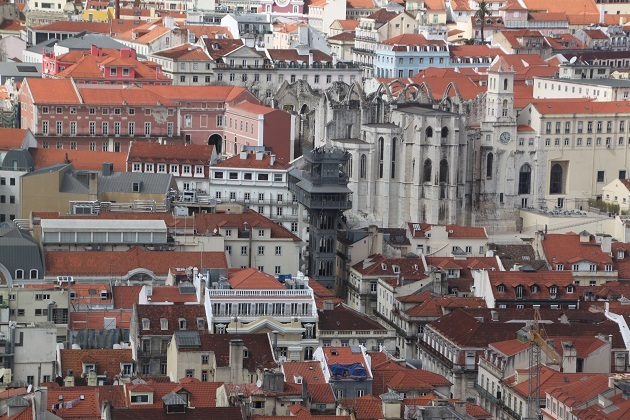 Just steps away from the viewing platform is a lovely little restaurant – Bella Lisa Elevador. We dined here – the menu is a Portuguese/Italian mix, Son was ecstatic to get some pasta. 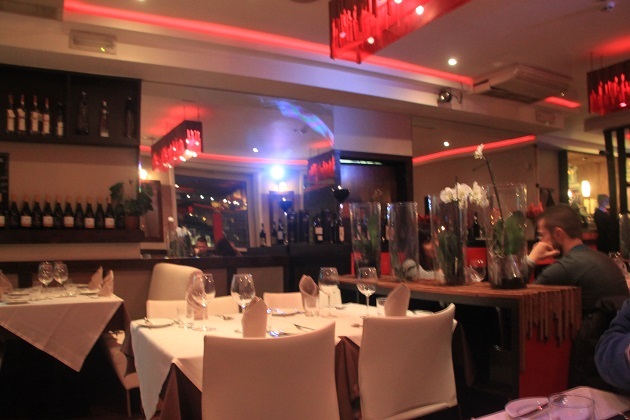 All of us enjoyed our food, the restaurant was quiet but with a lovely ambiance, views over to the castle and wonderful service plus extremely reasonably priced. 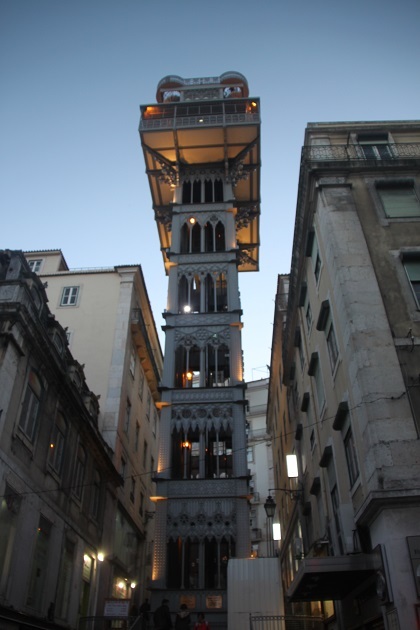 We finished in time to catch the last elevator back down to Baixa again – a perfect end to a perfect evening. Beautiful pictures! That view must have been really something. Thank you! The view at night was so gorgeous, now I wish we had also gone up during the day and seen the city at a different time. Another lovely day in Lisbon. The elevator was one of my favourites too. We only went up during the day as it was January when we visited and I think it closed about 6.00 pm. 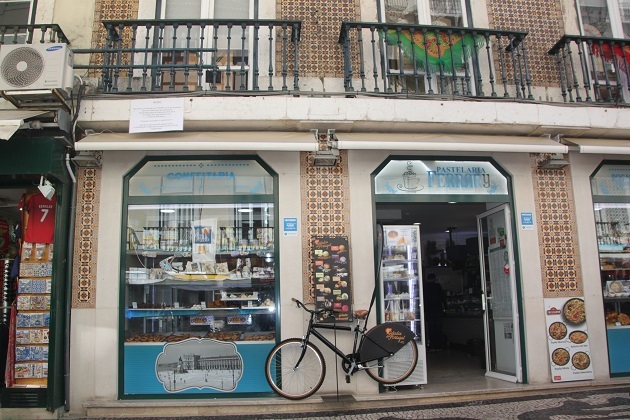 We also found Lisbon to offer good food at affordable prices. Hope you have a good weekend. It’s so beautiful isn’t it – I loved picking it out at different view points through the city and seeing it from all angles. We were amazed at how affordable (and good) the food was everywhere we ate. It’s a bit of a dull and dreary day here today – fingers crossed the sun comes back soon! Hope your weekend is good too Marion. It’s just gorgeous Tanja, I loved it and the views from the top! I love the idea of a lift to take you from the lowest point of the city to the highest. It reminds me of Luxembourg City, which also has a lift to speed up access between the Old Town and the Lower Town (Grund). Funny to think the queue wasn’t so long in the evening – I would have thought lots of people would want to see sunset and the sparkling city lights at that time of day! 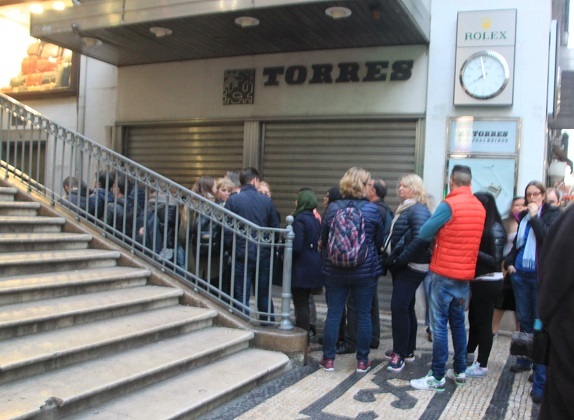 I was surprised at the queue as well in the evening, maybe we were just lucky that night but it was far shorter than during the day and we walked past the elevator most days during our stay. The views at night were just stunning. We just lucked out with the restaurant really – our son was really hungry and we figured it looked good – it was!! Joy, what a beautiful view. I would have thought more people might have come at night, lucky that you didn’t have a long wait! 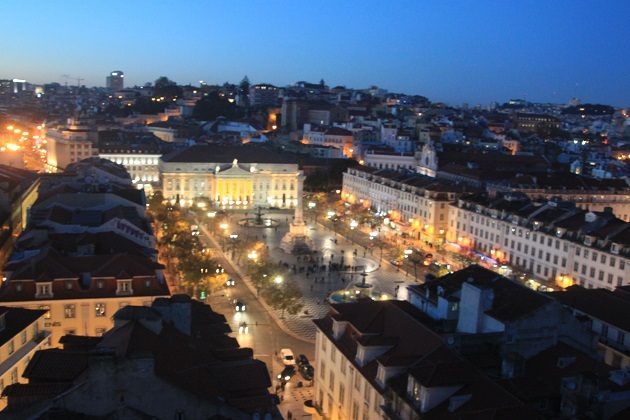 The night time view of Lisbon was just magnificent Pam, the short wait was a bonus too! This was so great George, the elevator is a beauty and the ride to the top is a bonus. We loved this area Rosemary and the elevator ride was a real highlight! Having some glorious weather right now which has been the perfect start to the summer holidays. We’re actually off to Yorkshire – Staithes for a week. Our son is going to a camp near Harrogate so my husband and I thought a break would be nice. Looking forward to it although it’s the first time we’ve been away without him – feeling strange about that! My camera sort of died after that Hilary so I was lucky to get a couple of pictures from up here. Oh no! What a bummer! Did you have to get a new one? Yes but managed to last out with this one for that trip!! The views from the top are quite stunning, it’s worth the queue! It definitely was – the ride up was great too. It’s a fun elevator to ride anyway but yes, the views are amazing.